Yep, as much as Johnny Ive and the gang talk about all the delicious curves and the infinity pool screen, when you see the thing on yourself, it's just a little computer on your wrist. Granted, it is a very nice wrist computer, but a wrist computer nonetheless. It was incredibly smart of them to make two sizes and focus on fine tooling, materials and a variety of different bracelets. It has everything it needs to destroy all the other smart-watches. However as a fashion item, it's not there yet. As a luxury item, it's not really there yet either and when you look at its dark screen most of the time, it's just a tiny dead iPhone on your wrist. I got mine with the Milanese Loop bracelet, which I find to be very comfortable and easy to adjust. Sure, sometimes it pulls on my arm hairs, but it is a light but secure, good looking bracelet that is leagues better than what the competition has right now. I also have the fluoroelastomer bracelet, which instantly became my favorite, and I hear that the leather ones are awful and like chicken nuggets. I would also like to point out (as I explained in my article after we first saw the Apple watch debut) that almost the entire design of the Apple Watch was once again ripped off directly from Braun. Enjoy the comparison below, while I keep hope alive for a truly original smart-watch in Apple's future. Having owned my fair share of other smart-watches, including Pebbles, Michael Bastian and a few smaller brands, the Haptic engine that taps your wrist to notify you of things is magical. It's just right and can almost always been noticed without being intrusive. I delight in it every time I get a notification, and it blows away all the other vibrating watches on the market. That said, it only seems to happen sometimes, with no apparent rhyme or reason. For instance, if I'm on my Mac, iMessaging a friend, it never registers a single tap during dozens of messages back and forth. Sometimes after getting one notification from an app, I won't get tapped for the next three in succession. It's a very inconsistent feeling, and I wish it just tapped each time I got a notification. As I said above, apparently, I really like being tapped. ...but before I get into that, let's talk about the watch faces for a second. I have no doubt that Apple will add more, and will eventually hand the reigns over to third parties which will really open up everything about the watch. It will be a complete game changer when you can have an ESPN watch face with special complications, including the next time your team plays or the score of the most important game, as well as a sports themed timer. For now, we get a handful of faces made by Apple, several of which I really like, and most of which I don't use. What has happened is that I tend to use the faces which give me at least three spots for complications as I get the most value out of: weather, activity, stopwatch and battery life. I'm so baffled by the fact that only a few watch faces give you 3-4 complications, while many faces give you none at all except for a choice of the date layout. The complications and access to quick weather and timing are really what keep this watch on my wrist over my analog watches, and I won't lie that it is hard to go back. One fun thing I noticed while I was recently in Iceland, which has a very unusual sunrise/sunset calendar, is that the Solar face, which shows you a representation of where the sun is in the sky, was completely wrong! I stood outside at 11:30PM with it still nice and bright outside, and the watch said the sun was deeply set. Having had several smartwatches, and for that matter, many smartphones, these days devices have a tendency to be in your face, distracting you all the time. Once you tailor your settings on your Apple watch, it really falls into the background in a way that you never realized you wanted from all of your electronics. For example, if your phone is open, you don't get notifications on your watch. It is smart enough to know that you'll be seeing those elsewhere and simply doesn't bother you with them. On the contrary, I get excited when I do get a watch notification because it is typically important enough to bother me with. It batches email and other notifications smartly, and does a great job of making you feel like an important person with a great secretary filtering what is worth interrupting you for. I'm impressed! Sometime during the second day of wearing the watch, I realized that I left my phone on the charger several hours ago and didn't even notice. We are so used to having to carry around our phone from room to room, that all of a sudden not needing to do so is a wonderful feeling. Sitting on the couch, listening to music from my Airplay stereo across the room, I would start getting up to change the volume or the song, and then sit back down and do it from my wrist. The gas company was supposed to show up and instead of hovering around my phone, making sure it wasn't on silent several times, I just did my thing and when the call came to my wrist, I answered it and told them to come up. There are lots of moments like this, when all of a sudden you realize you can do a task from your wrist and it has a calming effect. The anxiety of being a few rooms away from your phone gives way to a feeling of somehow being more on top of the situation and more informed at the same time. One thing that is readily apparent when you wear an Apple watch is that everyone knows what you spent on it. I've had many co-workers and friends aghast that someone (they mean me) would spend that kind of money on a watch. 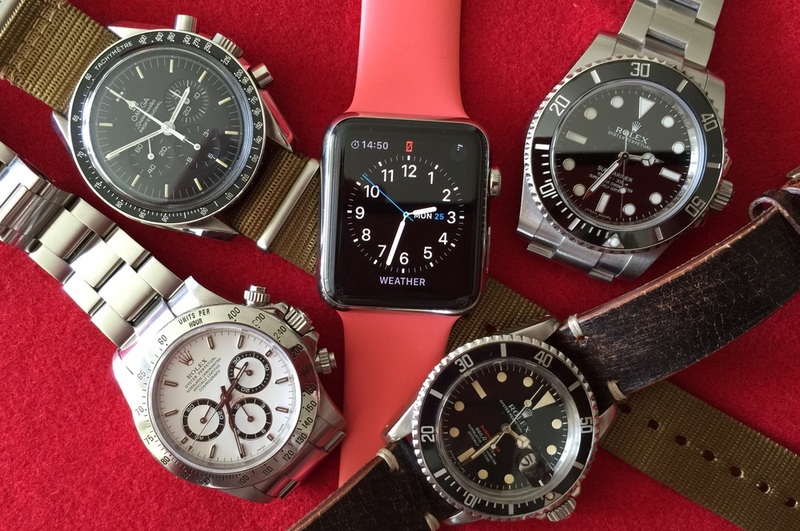 For years leading up to donning the Apple watch, I was in their presence in my other watches that cost up to 30 times more than what a stainless steel apple watch costs. However, not once did anyone even think about either a) that I was wearing a nice watch or b) that it costs more money than they would ever be comfortable spending on one. So, ironically to most, wearing an Apple watch is a much more noticeable statement about your financial status than wearing a high priced Swiss or German watch. Although I guess Rolex doesn't make headlines for weeks with their prices written in every article, so it is somewhat understandable. I've now been in a staggering number of intellectual clashes where I find myself defending the Apple watch against someone, even though I don't feel like anyone but reviewers, die hard Apple fanboys, exercise nuts and gadget freaks should have one. Not yet anyway. Them: "But I don't understand, what's the point? Your phone is right there." Me: "Sure, but my wrist is closer. It's nice to reply to a text when I'm charging my phone in the other room, or my phone is in my backpack." Them: "But why would anyone need that, you have a PHONE you can do that with"
Me: "Yeah, I know, but this is 5% easier than going and dealing with my phone. It's a luxury item, it's meant to be a luxurious experience, so what if it's only incrementally better, the experience is easier and more fun." Them: "But why would anyone spend that much money on something that doesn't do anything?" Me: "Again, it's a LUXURY ITEM. LUXURY. Not a necessity, not at all. Plus it's a watch that happens to have a lot of extra features. Don't worry about it, you don't need one!" Them: "But I don't understand, what's the point? Your phone is right there..."
I recently took a flight to Iceland, and had my first chance to use Passbook on my Apple watch. I had gotten the tickets into Passbook on my phone, confirmed they appeared on my watch and figured out how to get the bar-code to appear while in the car to the airport, so I would know what to do. While waiting in line to get onto the plane, with only one or two people in front of me, I clicked the crown, found the Passbook app, opened the ticket in between my Starbucks card and other credit cards, and scrolled it to the position where you can see the QR code. Not 15 seconds later, the watch turned the display off as usual. And when I got to my big moment with the person who scans the boarding passes, I was back to the clock face again. Instead of fumbling for a while to get to the app, and get into the ticket on that app, I pulled my paper boarding pass out, and decided it just wasn't worth it. While this is clearly the biggest 'First World Problem' ever, it isn't that I was so put out that I deserved to be mad, but that this is indicative of the problems of using just about any app. There needs to be a gesture to say 'hold onto this app for the next minute or two', as it is very arbitrary when the watch will turn off the display and close the app you were about to use. The same thing happened to me again a few days ago at a Starbucks, and again while trying to use Apple Pay, and setting up Turn by Turn directions on Maps, and the list goes on and on. I'd like to take a moment to note several of the little but important parts of the Apple Watch experience as it stands right now. Charging - I have written in my early impressions on the watch that low battery life will be its downfall. While I am certainly excited for a time when the Apple watch gets a few days of battery life, it isn't as bad as I thought it would be right now. You throw it on the charger at night, and put it back on in the morning. What you lose in that (which other smart wearables have) is the ability to track your sleep, something I would really love to use the watch for. The charger pops on easily with the magnet and has an extra long cord compared to iPhone charging cables, which is a nice touch. Packaging - I got the Stainless Steel model, which came in a very nice cube box and was tastefully presented. It was fairly simple to set up, although I initially was confused by pointing my phone at my watch to pair it. Gestures - While the hit zones (tappable targets) on the watch are small compared to a smartphone, they seems to work fairly well. The lock screen where you have to tap your pin usually picks up correctly on my hastily tapped-in code. Swiping from the top and bottom has been flawless, and even picking those tiny app circles is easier than I expected. Comfort - While the rubber strap is by far the most comfortable I've tried, the Milanese loop is also really sturdy. The watch isn't top heavy but it does have enough weight so that you know it is there, even at half the weight of my analog watches. Crown - I don't find I use the crown very much, but when I do, it is a good experience. It has good feedback when pushing it in, and scrolling with it is smooth with enough resistance to have control over what you are doing. I especially like that when you get to the bottom of a scroll, it bounces back and gives you a tap to let you know it is the end of the scrollable area. Glances - While I do use these now and then, most of them take so long to load that I stick to the ones like Battery Life and Heart Rate, which are always available and ready to tell you what you want to know. Notifications - It seems like some notifications are really useful and some don't tell you anything important. Twitter and Facebook Messenger are two that I've noticed which only tell you something happened, but not what. On the other hand, Overcast, iMessage and the New York Times give you a bite-sized piece of information that doesn't make you have to go find your phone to figure out what a cryptic notification was about. As developers get used to how to leverage the Apple watch, I'm sure this will get better, and I'm equally sure some developers, who want more views of their app, will keep sending empty notifications, which Apple should crack down on sooner rather than later. Exercise tracking - This one seems pretty good, but as someone who doesn't do a lot of exercising, it's been hard to figure out how to use this effectively. We need more types of exercises than the ones that Apple gives you, shoving all the most basic ones (e.g., running, cycling) into the "Other" category. What if you are skiing? Weight lifting? Boxing? The Other category supposedly figures out your exertion based on your heart rate, at which point I wonder why there are categories at all. I also have trouble finding the results of my workouts, which I guess are split between the Activity and Heath apps on my iPhone. Small things, but to me this doesn't 'just work'. Being on all the time. Always lit up and on the clock face. I know that Apple can't do that right now because of battery limitations, but if it were always on, I would enjoy wearing it all of the time. The simple fact is that it's a pain to flick your wrist and get into watch reading stance three times in a row until it works. It's not horrible, and you can always tap the screen, but if it were always on, always glance-able, I know I would enjoy it more. Seeing it in the mirror is always a let down because it's just a sad empty soul of a watch. There is more than just potential here, and it has done a lot to my drive to put lots of my disposable cash into more analog watches in my future. I'm already considering consolidating further to make the few analogs I do have extra special, and I am really excited for future versions of the Apple watch.